Alangu Mastiff, also known as Indian Mastiff, is a very powerful and fierce war dog. 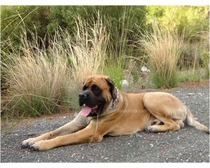 Read on to know more about the Alangu Mastiff breed of dogs. Breed type: Rare breed, fighting or guard dogs. Alangu Mastiff or the Indian Mastiff is a rare breed of dog that is mostly found in the Trichy and Thanjavur districts of South India. Alangu Mastiffs are massive, powerful dogs that are mostly used as guard or war dogs. They are renowned for their sharp instinct and guarding skills. However, the breed is not recommended for first time dog owners or for owners who are timid in nature. It requires a lot of experience to properly train and handle Alangu Mastiff dogs. To know more about this unique breed of animal, go through the information given below. The origin of the Alangu Mastiff can be traced back to the Bhawalpur area of Punjab, parts of Rajasthan and the desert area of Kutch. Today, the breed is commonly found in two districts of South India, Thanjavur and Trichy. It is also known as the Sindh Mastiff, as a part of the Kutch area in Rajathan, where it is said to have originated, was earlier under the Sindh district (now in Pakistan). Although there is no exact documentation to support the theories, it is believed that the Alangu Mastiff dog breed existed in ancient India as far back as 486 BC and was introduced into Greece between 486 and 465 BC, by Xerxes the First. Alangu Mastiffs are mostly regarded as war dogs and were, in fact, used by Alexander the Great, who brought the breed from India. It is speculated that the dog was one of the breeds used by the Persian Army during times of emergency and war. In fact, the breed was used as the army’s official guard dog, to guard the camps of the soldiers. However, the India Mastiff was never used to perform any kind of suicide jobs. The dog was also used by the Indian royal families for the sport of hunting large game like cheetahs. Even today, the dog is used for the purpose of fighting, in parts of Pakistan, where it is commonly known as the Bully Kuta. Similar to the mastiffs, Alangu Mastiff is a tall and massive dog, with an average height of 29 to 30 inches. The original height of the breed was, however, measured at 30 to 34 inches. Physically, the dog has powerful structures and is muscularly built. It has a medium height and the entire neck and mouth is covered by lose and flabby skin. 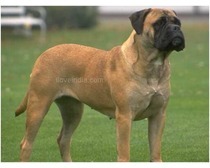 Indian Mastiffs have a back long, their limbs are well built and their tail narrows down to a point. These dogs have a short flat double coat, which is usually red, fawn or brindle, with varying markings. They have high set ears, with a muzzle that is black in color. Their broad skull, the widely set ears and a muzzle (which is half the length of the skull) gives the head a rather square appearance. They have highly alert expressions and walk with long and graceful strides. Mostly popular as fighting and guard dogs, Alangu Mastiff is expected to have an aggressive and vicious nature. Due to these qualities, it is often regarded as a priced war dog. This dog is, however, very hard to train and requires large living space, as the breed has high exercise requirements. As such, an Indian Mastiff will never be satisfied in small apartments. It requires ample of space to play and run. The animal has very strong guarding instinct and possesses a strong drive to hunt. In fact, the dog has earned the reputation of being ferocious and blood thirsty. However, when trained properly, it would turn out to be a faithful and loving pet that will be gentle to its owners. Alangu Mastiff has very low maintenance coat and hence, is preferred by many. It has a short coat and does not need any kind of extensive grooming. Also, it sheds in moderate amounts, to maintain the good condition of the coat. In terms of grooming, all you have to do is brush the coat with a firm bristle brush. For cleaning the dog and bringing out the sheen of the coat, a damp towel will be sufficient.